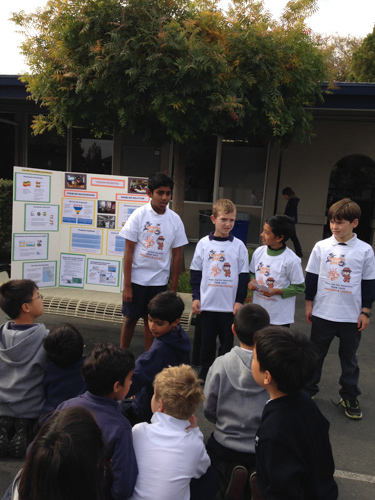 Just before Thanksgiving break, grade 3 students Rahul Mulpuri, Dominick Piscione and Grant Sims won first place in the project category at a First Lego League (FLL) robotics tournament. The team, the youngest in the tournament, was chosen from 24 competing teams for their idea/presentation on early warning systems for earthquakes. In advance of the tournament, the trio benefited from an informal practice session/demonstration in front of their teachers and classmates on the lower school blacktop. “They did a wonderful job describing their initiative and showing us their Lego demonstration,” said Kim Cali, director of the lower school’s BEST program. Cali said she was impressed that the third graders had the initiative to request to present their project in front of their teachers and classmates as practice for the event. “They were very excited to be given the opportunity and committed to putting their presentation together for us and for FLL,” she recalled. The First Lego League is a well-known robotics program for children ages 9-14, designed to get young people excited about science and technology, while teaching them valuable employment and life skills. While FLL is often used in the classroom, it is not designed solely for this purpose. Teams comprise up to 10 children (with at least one adult coach) and are often associated with pre-existing clubs or organizations. Currently, there are over 20,000 FLL teams competing in more than 70 countries.